Just recently, the Sakura tree planted in Church opposite of our Ryokan are started to bloom. According to forecast next week will be the good week to see Sakura in Kyoto. The life of Sakura flowers are not that long, but that's why the flower looks so beautiful. Now is the time to come to Kyoto! Our rooms are getting full very quickly. We look forward to all of the guests coming to NISHIYAMA RYOKAN. We now have Kaiseki meal for vegetarian guests as well. since we thought the quality of it will be poor. Now our chef come up with brand-new menu for vegetarian Kaiseki. All foods are now specially made for vegetarian. We hope our vegetarian guests will enjoy the traditional Japanese Kaiseki too. Fish Broth are very important for Japanese traditional meals. We can not make Kaiseki without this. If you can not eat Fish, we can not serve Vegetarian Kaiseki. There are some Vegetarian Restaurants available around our Ryokan. Please ask us at the front desk for restaurants. Like there are many different kinds of Western Tea and Chinese Tea, there are many different kinds for Japanese Tea too. We will be holding Japanese Tea tasting in our lobby. Japanese teas are famous for containing many healthy components. Please enjoy many kinds of Japanese tea　and relax. For reservations, please ask us at the reception before 18:00pm on the day. *PLEASE NOTE: The charge has changed to 800 YEN. I went to Uji last weekend for short trip. Uji is the city placed in about 30mins from central Kyoto. 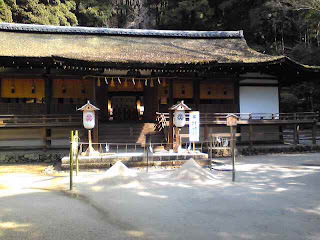 Uji also has long history, and many historical monuments in the city. 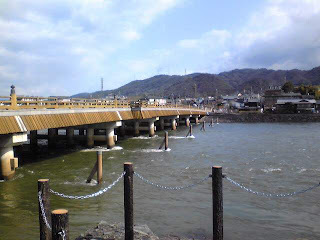 There are river called Uji-gawa and the big Uji-bashi are famous. This Uji-bashi is one of the oldest bridge in Japan. the brige drifted away every time. The bridge has been reconstructed everytime it is drifted in. technology and the one of the important road in Uji city. Ujigami shrine is probably the oldest shrine in Japan. The roof is layered by Japanese cypress peel. 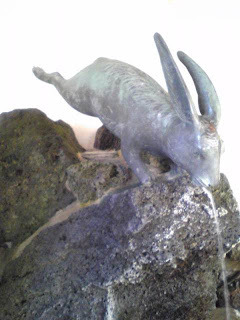 Uji originally meant "The road of Rabbit"
So there are many things inspired by rabbit are placed in Uji city. To get to Uji, take JR line from Kyoto Station. Perhaps it is a nice day trip from Kyoto city? We will be holding tea ceremonies in these dates. It is free of charge and anyone can join. Please come and enjoy the Japanese Tea! !